This past weekend my hubby (yes we’re now married!) 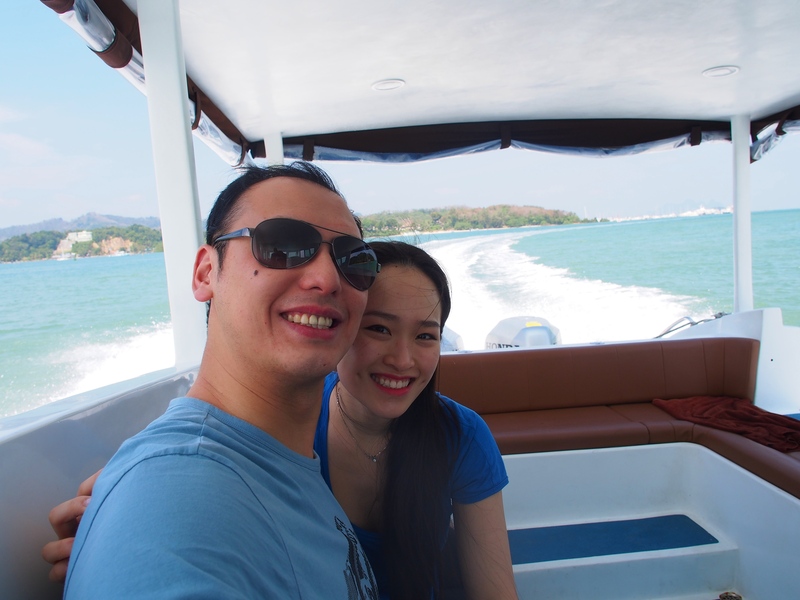 and I went to Naka Island, a Luxury Collection resort and spa in Phuket for a short pre-honeymoon getaway after the wedding. We banned all cellphones and just rebalanced, reconnected, and, not to overkill on cheesiness here, basically fell in love again. With the stress of wedding planning these past 1.5 years, we’ve almost forgotten what it feels like to just be in love and carefree. Many friends have asked me what it feels like to be married, and I just keep saying it feels so amazing! I don’t miss the wedding planning or the engagement period at all. We are just so thankful the wedding turned out so smoothly that we just want to savour the peace and accomplishments of our hard work. 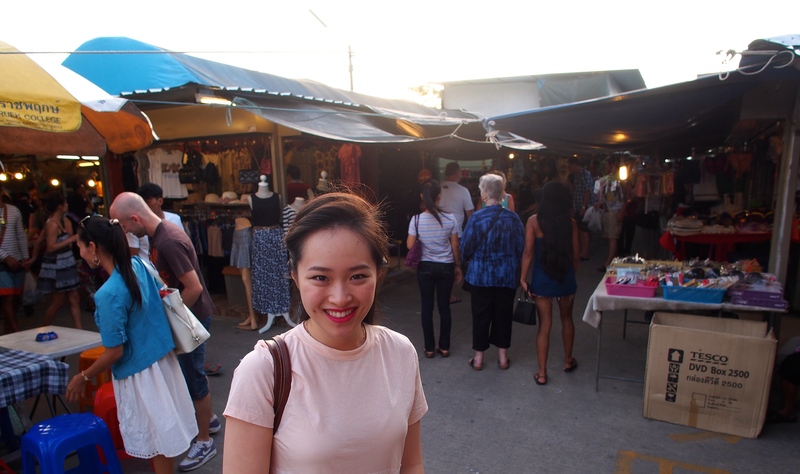 So besides from chilling by our private pool with my new favorite drink of fresh coconut water with mashed watermelon and mint, we went to the Phuket Town Night Market (Wai-Rat-Hong-Yuk Road) for dinner on Saturday. 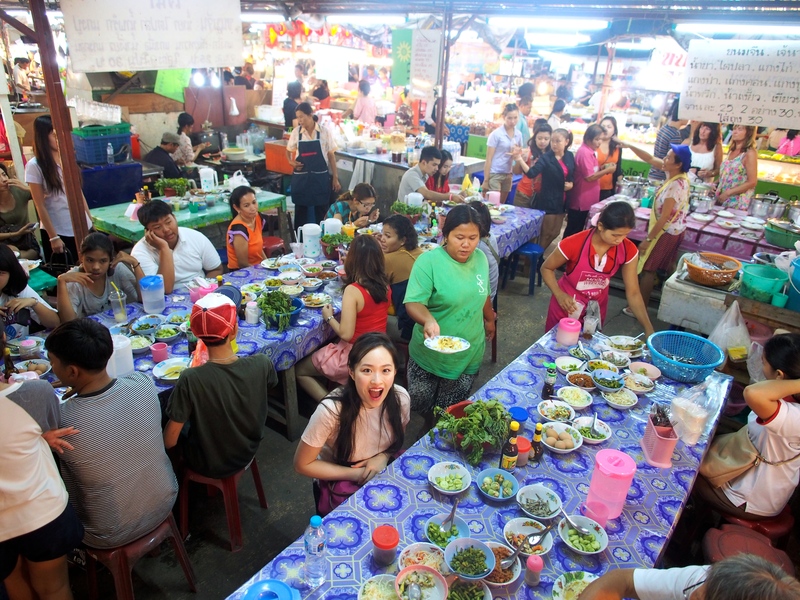 It is the biggest and most well known market in town and is easily reached by taxi. It is only open on Saturday & Sunday 4pm – 9pm. We went from 5-7 pm, it did get busier later on but we were still able to comfortably navigate our way around. 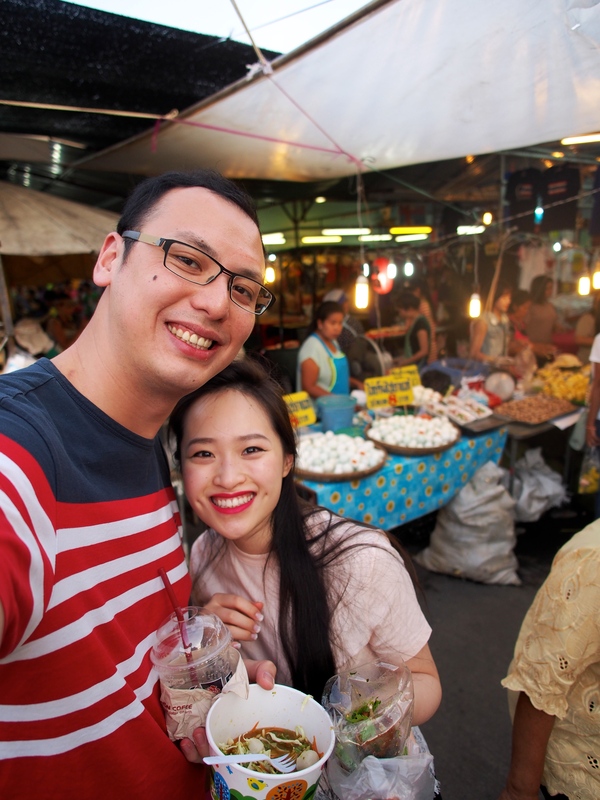 It was honestly the best night market for food we’ve ever been to; we actually both agreed that we liked it even more than our other favourite Shi Lin Night Market in Taiwan! 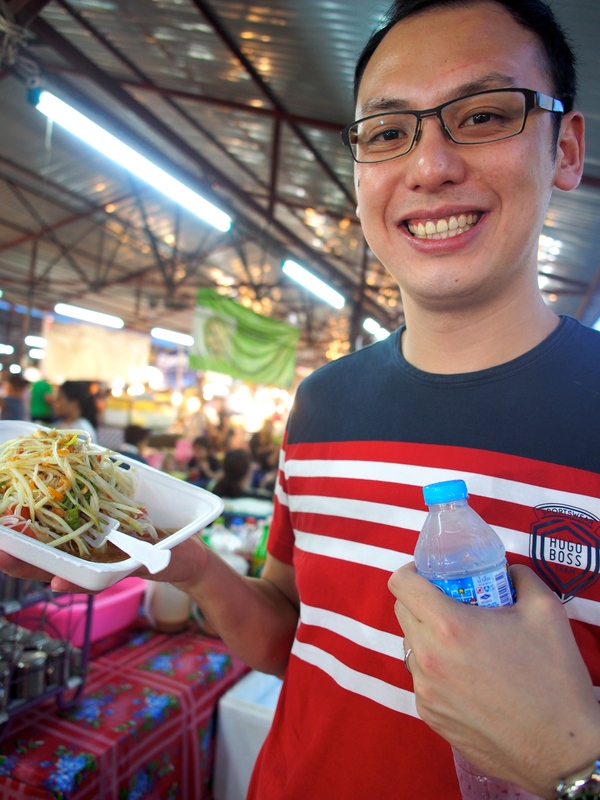 As with most night markets, there are goods and foods stalls- obviously we went straight for the food. We were immediately sucked in to the bright colours and fragrances. It was such a treat seeing all the different fresh ingredients being transformed into bold dishes in front of our eyes, it really was like a playground for me. 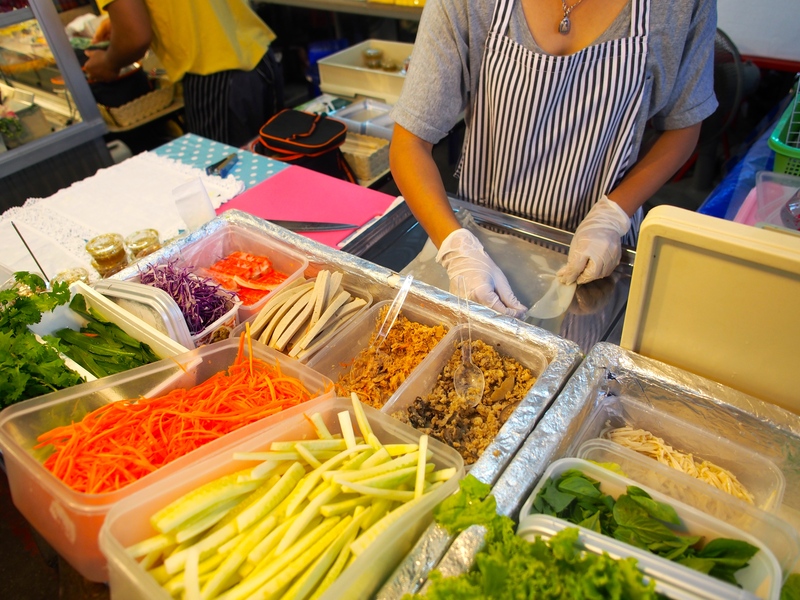 Thai food is all about big bold aromatic flavours using fresh spices and herbs, harmonising spiciness/sourness/sweetness/saltiness, and never lacking in crunchy texture. There was so much food we wanted to try that we had to take a sampling approach- buy a little bit of everything just to get a taste. 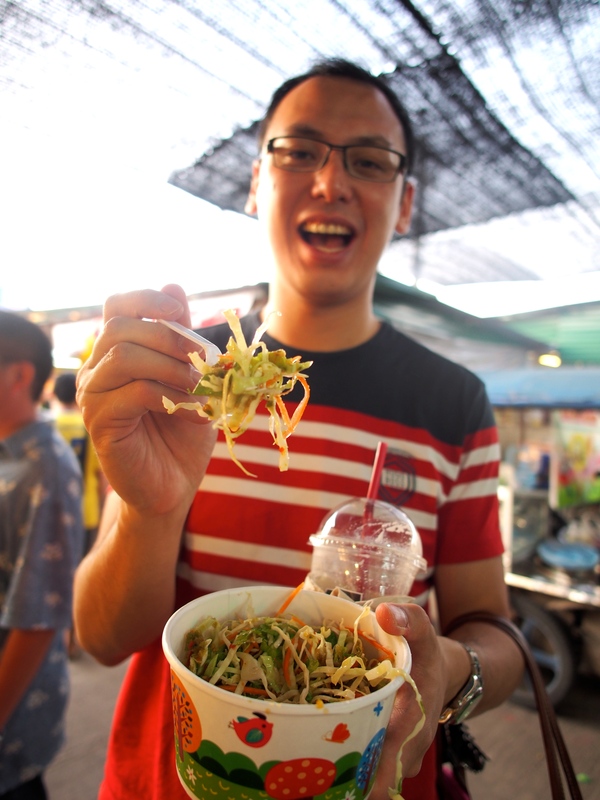 The food was really affordable, ranging between 20-40 baht (~1 CDN$). 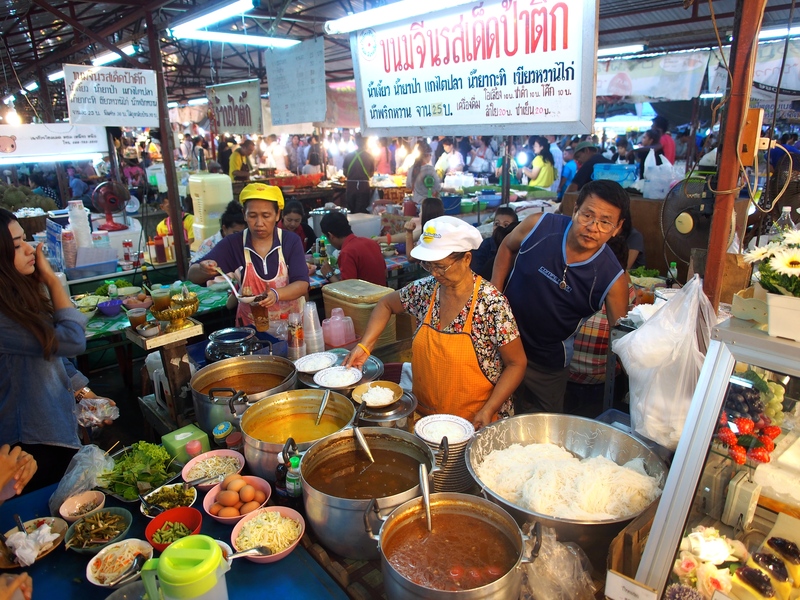 The market is extremely tourist friendly (and so it is filled); and although most of the stall owners couldn’t completely understand English, they are really friendly and body language is all that’s needed. And so the journey began with aromatic fried fish cakes topped with basil, cucumbers, carrots, cilantro, and sweet/hot fish sauce. The fish cake paste had a curry base and was extremely soft, almost like a Thai curry flavour fried 鱼腐 (tofu fish cakes). 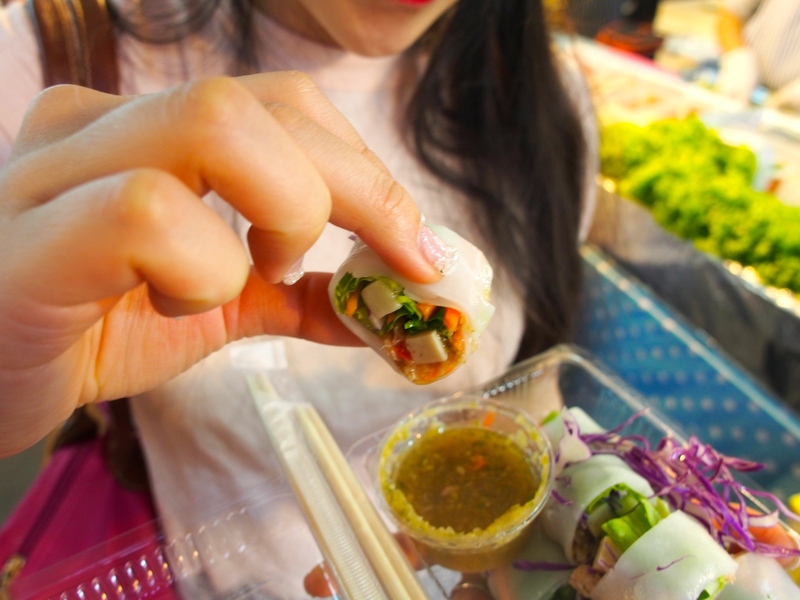 Freshly made rice paper rolls with cilantro, carrots, cucumber, lettuce, imitation crab, and pork with a ground lime chilli dipping. 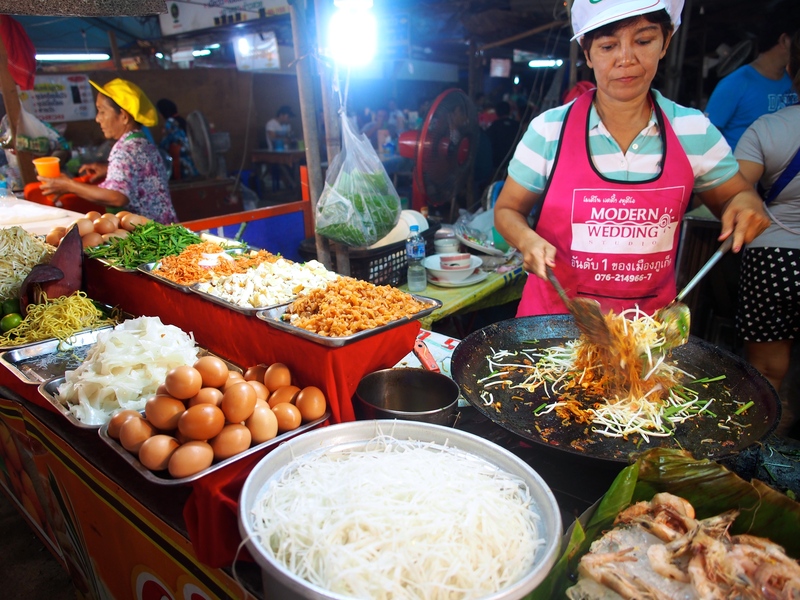 Here this lady made Som Tam (green papaya salad) out of an array of fresh veg and herbs in a pestle and mortar. 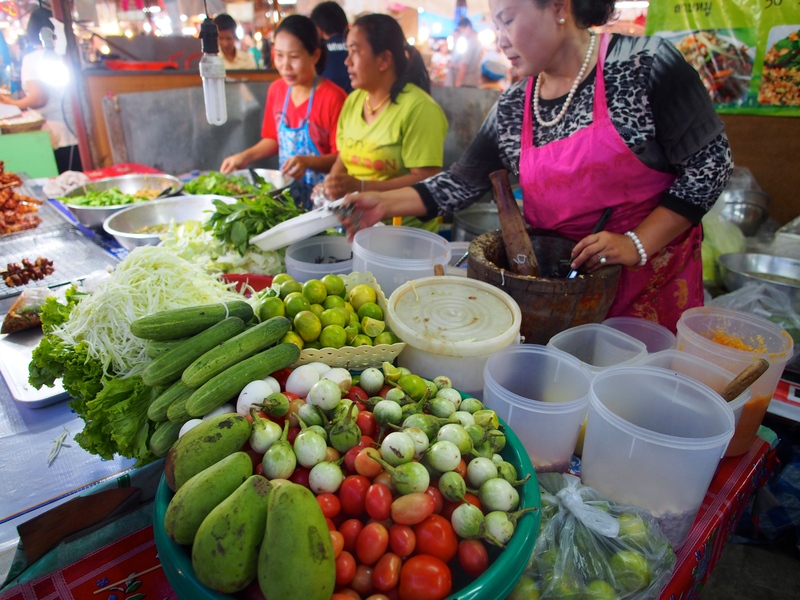 Using a pestle and mortar to pound the green papaya, cucumber, carrots, tomato, cilantro, lime together really helps to release and blend their juices together. 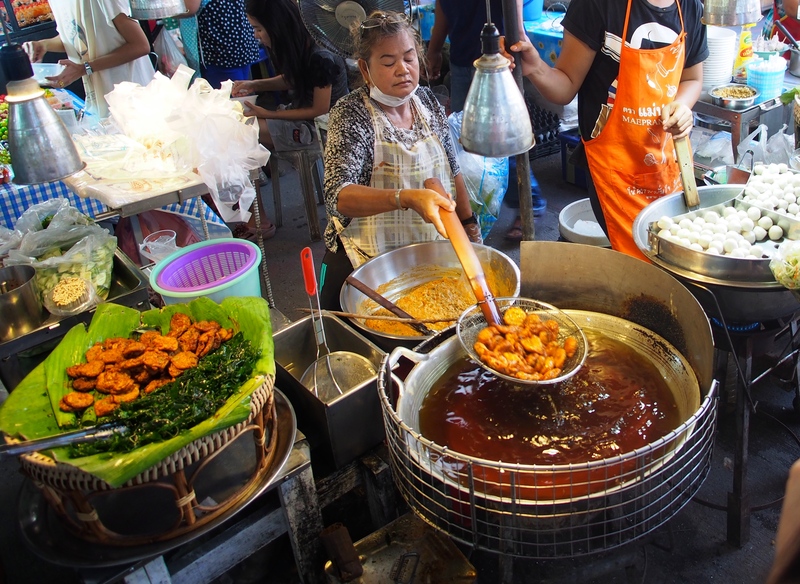 Then toss in fish sauce, sugar, ground peanuts, lime juice, shrimp paste and you’re good to go. The fun part was I got to choose everything that went in so I added some thin rice noodles in! Bosco got so excited to see this, as he calls it, ‘professionally fried instant noodles’ and couldn’t resist trying it. It wasn’t quite as chewy and didn’t have any Thai flavours as I had expected, just regular soy sauce fried instant noodles. 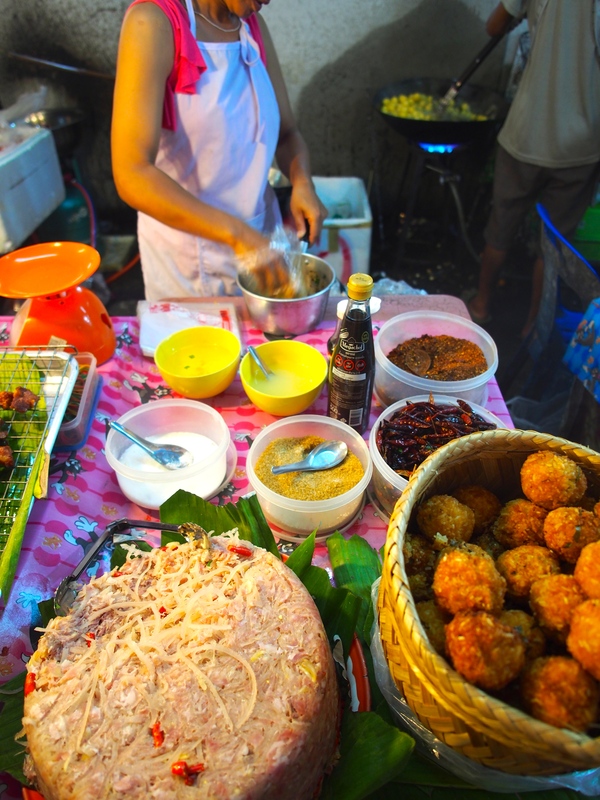 This gelatinous pork patty and deep fried rice balls were chopped up and tossed with ground chilli, peanuts, cilantro, sugar, fish sauce. A textural delight. 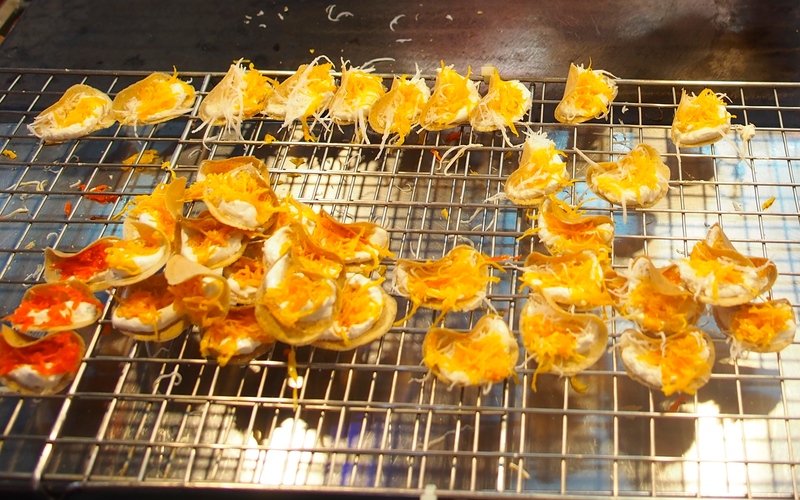 At this point I could really see Thai people love crunchy textures and grinding/tossing everything together. 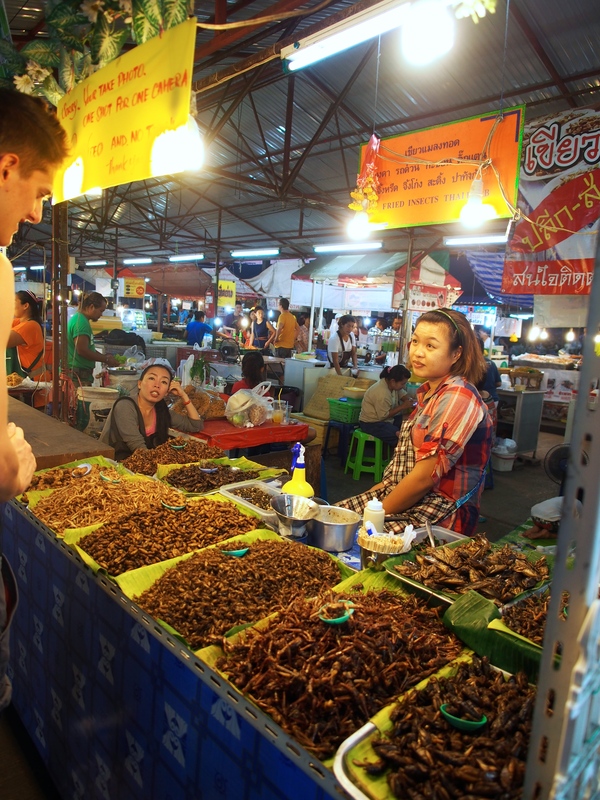 I didn’t quite have the guts to try these deep fried insects but I’m sure they were quite the tourist attraction. These freshly made warm crispy crepes were perfectly complimented with softly whipped sweet coconut milk and toasted coconut shreds- delicious! Hmm time to brainstorm how to make these myself..
And finally, my favourite noodles- pad thai: rice noodles fried with tofu, eggs, shrimp, chives, preserved radish, bean sprouts, and topped with peanuts and lime juice! This was the best pad thai we had this trip because it was steaming hot and slightly more sour than the ones we eat back home, which is how I like it! I do have to say my favourite pad thai is still from Mango Tree though. And last but not least- mango sticky rice! 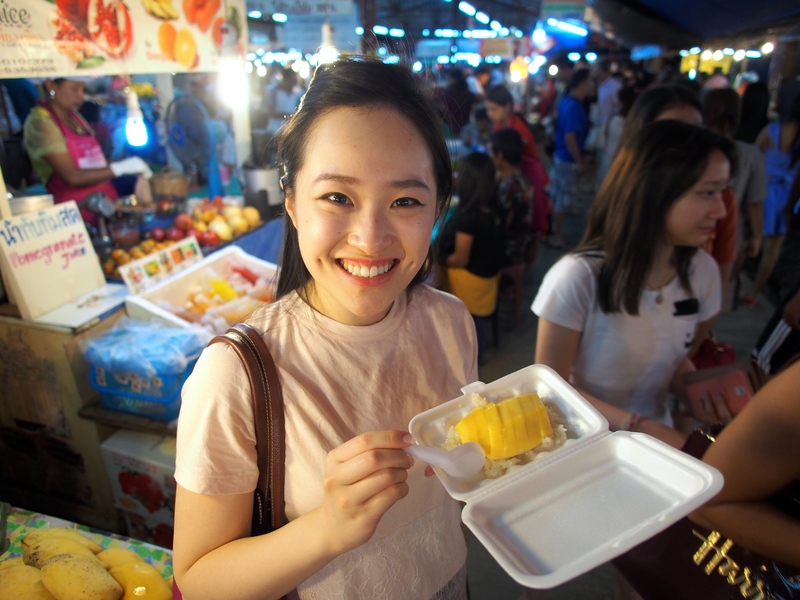 Warm sweet chewy glutinous rice topped with a dash of aromatic coconut milk and tart mangos, life can’t get any better! 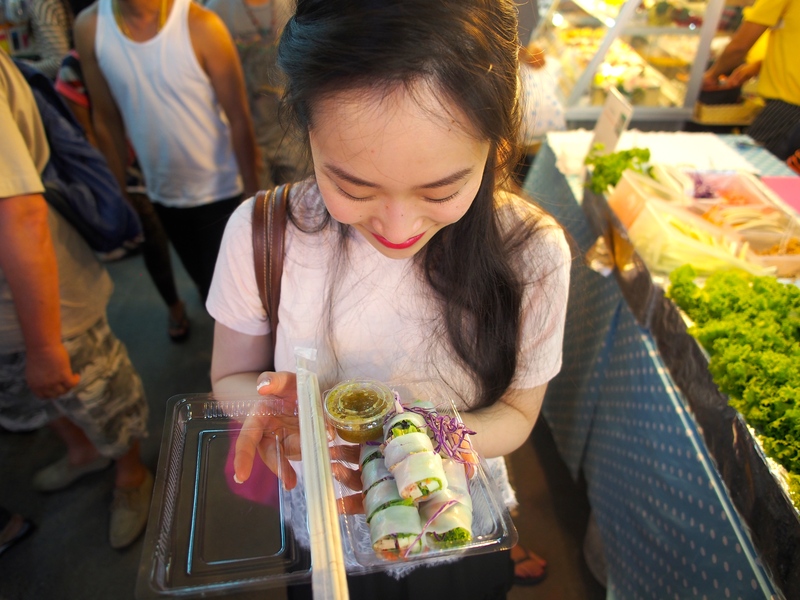 My favourite part about this market is that all the fresh ingredients are laid out in front of you and you get to pick whatever you want to go into your food, so it really was a playground for me to experiment with new things! 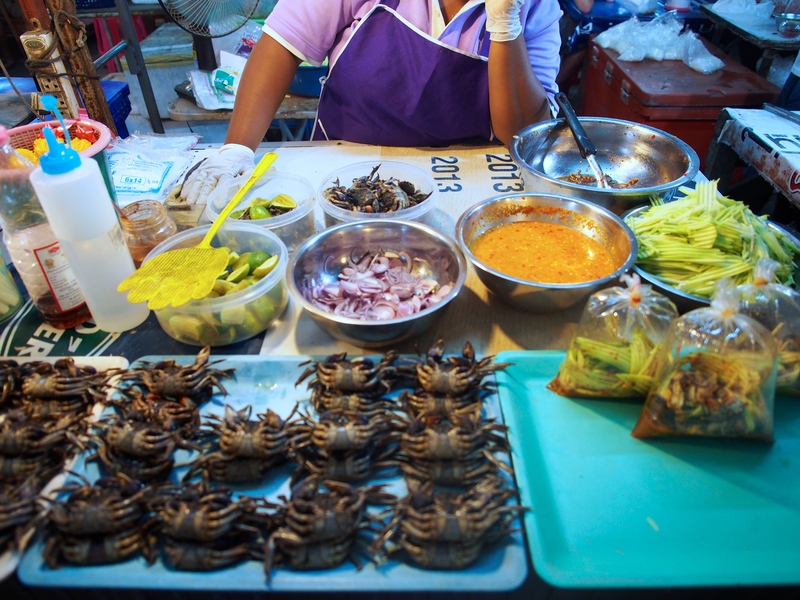 There is a wide variety of food sure to please all tastes buds so if you’re planning a trip to Phuket soon, we highly recommend stopping here for dinner! 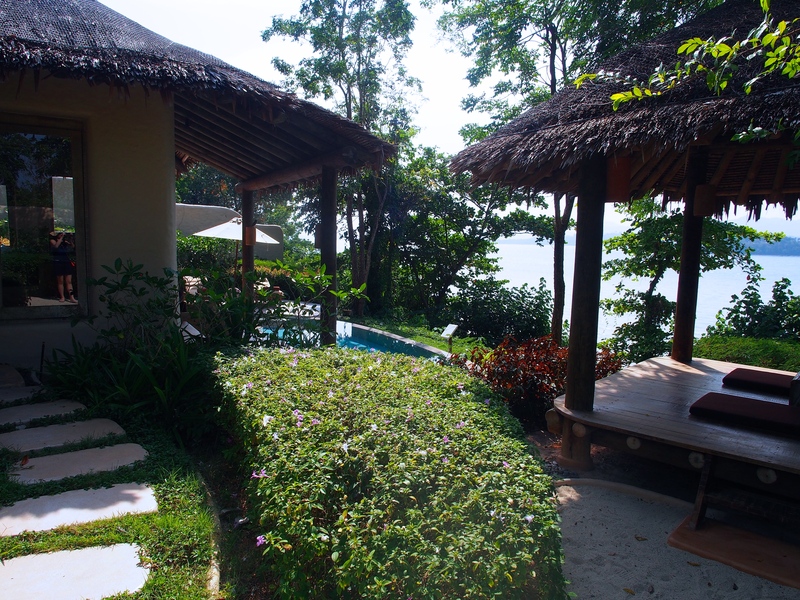 Coming soon: Thai style basil fried with minced beef with egg over rice, a recipe inspired by this Phuket trip! “Kow pad Pla kem” (鹹魚炒飯) is my favorite Thai fried rice. I like it more than the minced beef! 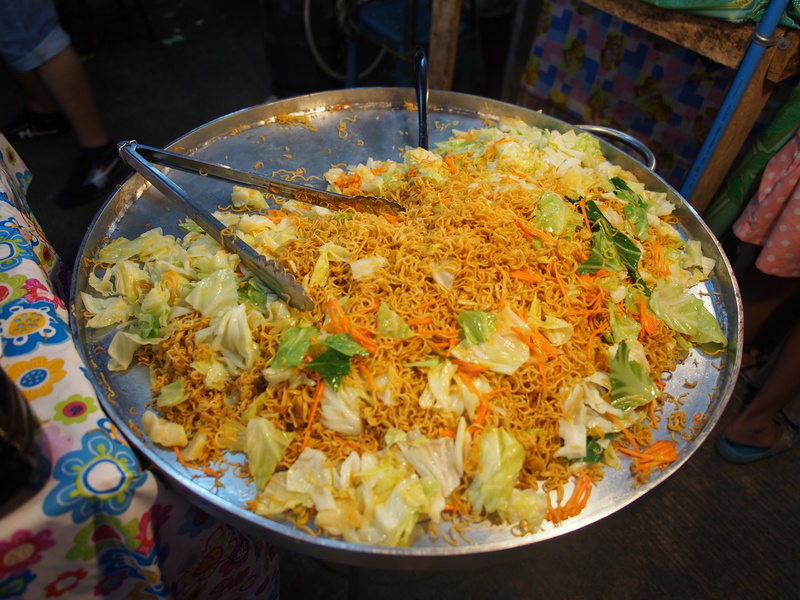 I literally had all sorts of Thai fried rice every day when I was in Phuket. Your pictures are absolutely beautiful! I can’t wait to see what dishes you end up creating from this trip!! Thanks Ruth! I’m working on the next post now 😀 thanks for your support as always !